It was little over a month ago that nickel was trading at sub-US$10,000 per tonne prices, indicating it was no surprise that a three-week/circa US$1800 per tonne spike between October 21 and November 11 was going to ignite interest in the commodity. However, this could be part of a more sustained run given that nickel for the best part has remained above US$11,000 per tonne, and as recently as this week pushed up towards the US$11,700 per tonne mark. Last time it traded at these levels was in mid-2015, and at that stage, as the largest ASX listed pure nickel play, Western Areas (ASX: WSA) was hovering in the vicinity of $3.70. The company’s shares have increased from approximately $2.40 in early November to hit a recent 12 month high of $3.43 as investors flocked to the commodity. This places the company’s market capitalisation in the order of $870 million. It should be noted here that commodity prices do fluctuate and also, historical data in terms of earnings performance and/or share trading patterns should not be used as the basis for an investment as they may or may not be replicated. Those considering this stock should seek independent financial advice. However, one important factor appears to have gone unnoticed and we will look at that when examining the company. 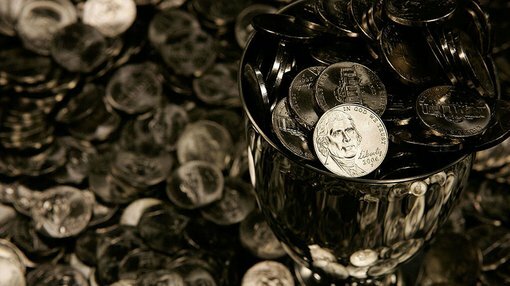 Returning to what may lie ahead for nickel price, analysts at Macquarie Wealth Management are fairly upbeat about its prospects, noting at the end of November that there was evidence of disruption to China’s traditional business model whereby it sources the raw material either domestically or internationally as it has the capacity to produce a refined product. Looking at current dynamics the broker said, “In our view, the cost structure of producing nickel pig iron and Ferro chrome in China from imported raw materials goes a long way to setting the price for these products, and as such the recent and potential future ore price rises are certainly worth watching”. The broker said it sees the potential for strong nickel price rises in the first quarter of 2017, suggesting London Metals Exchange (LME) prices could push up towards US$12,500 per tonne. Although broker projections and price targets are only estimates and may not be met. The metal last traded consistently in this range between March and June 2015. At the start of that quarter, WSA was trading north of $4.00, having hit a 2015 high of approximately $4.50 in February. The question now is whether it is too late to climb on board WSA, or is there circa 40% upside which would see it back around the $4.50 mark. It could be argued that some of the steep share price falls in base metals were to a certain degree a function of investors being educated along the lines that the likes of lithium, graphite and cobalt were the only new age metals. Interestingly, this perception mainly revolves around the transition to electric power cells, power storage and more specifically, the emergence of electric vehicles. However, Tesla Chief Executive, Elon Musk has openly stated that the group’s cells should be called Nickel-Graphite because primarily the cathode is nickel and the anode side is graphite with lithium being ‘the salt on the salad’. 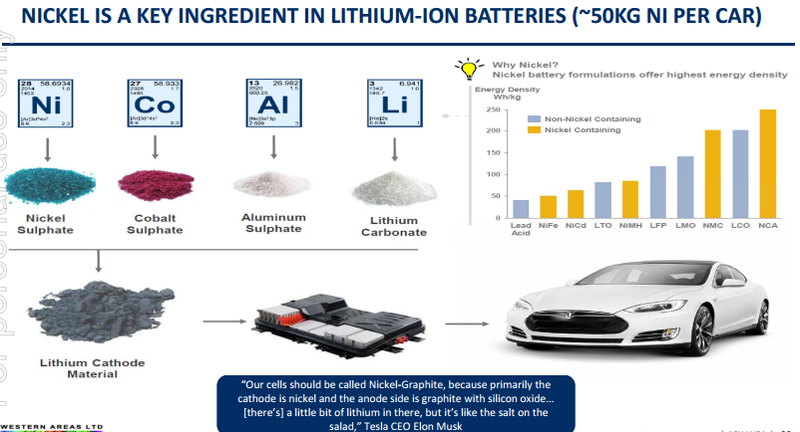 The following graphic provides an interesting snapshot in relation to the point Musk was making and underlines the fact that nickel battery formulations offer highest energy density. Further emphasising this point, analysts at Macquarie highlighted the potential supply demand electric vehicle related impact would have on nickel in saying, “Assuming circa 50% of EV batteries are nickel containing and that the average intensity based on the relative NMC/NCA breakdown is 0.7 kilograms Ni/kWh, then nickel demand in EVs could grow from around 10,000 tonnes in 2016 to 38,000 tonnes in 2021”. This excluded pure hybrids which account for between 10,000 and 15,000 tonnes of nickel demand today. Over the last 12 months Western Areas has laid the foundations for what promises to be a period of strong sustained medium-term earnings growth. In particular, the $24.5 million acquisition of the Cosmos nickel project which is currently the subject of a prefeasibility study (Odysseus deposit) should boost earnings substantially from 2020 after making a maiden contribution in 2019. The fact that WSA is a multi-mine pure nickel play with a long mine life not only makes it an attractive investment proposition, but it also stands out as a likely acquisition target. The big mining houses tend to opt for high quality long-term assets with attractive economics and no baggage. The latter often equates to a simple asset structure where there aren’t any complicated non-core operations, and WSA offers just that. Consequently, it could be argued that the group demands a premium multiple, and while the recent rerating was relatively strong it merely factored in a recovery in the nickel price. From an operational perspective, analysts at Macquarie are forecasting WSA’s Flying Fox and Spotted Quoll projects located in Western Australia to produce 24,000 tonnes of nickel in ore in fiscal 2017 with production increases of circa 10% per year out to 2019. In fiscal 2020 WSA should benefit from a full year’s production from Cosmos, which Macquarie is forecasting will be in the order of 14500 tonnes, bringing group production to approximately 40000 tonnes. Based on a nickel price of US$6.58 per pound, the broker is forecasting WSA to generate a net profit of $124 million from revenues of circa $560 million in fiscal 2020, representing earnings per share of 45.2 cents. This places WSA on a forward PE multiple of 6.8, seemingly conservative for a company that is forecast to generate compound annual earnings per share growth of 65% between 2017 and 2020. Furthermore, it is well short of a multiple that would need to be paid for control of the group by a potential suitor. Again, remember that broker projections and price targets are only estimates and may not be met. We talked earlier about a factor that appeared to have gone unnoticed. While it could be argued that WSA’s heavily discounted valuation relative to its peers and growth profile has gone unrecognised, there was an important recent development that had a fleeting impact on the group’s share price, which is now trading below where it was prior to that event. On November 28, WSA announced that it had entered into a 10,000 tonnes per annum three-year offtake agreement with China’s largest producer of stainless steel, Tsingshan. Immediately following this news the company’s shares increased from the previous day’s close of $3.15 to hit an intraday high of $3.31 before closing at $3.28. The past performance of this product is not and should not be taken as an indication of future performance. In discussing the contract, Macquarie said that it expected the offtake to yield a higher nickel payability rate as it will be processed through a nickel roaster rather than a nickel smelter, a process which yields higher recovery rates and better economics. While this news was promising in its own right, Macquarie highlighted the strategic benefits of the contract in saying, “Securing a large offtake with a nickel roaster like Tsingshan has lifted the bar for WSA’s remaining concentrate offtake negotiations, which we expect would be on similar terms”. The following day WSA announced that it had negotiated a 10,000 tonnes per annum three-year offtake agreement with BHP Billiton Nickel West. A week later, the company’s shares remain range bound between $3.00 and $3.20, seemingly oblivious to the fact that WSA has just locked in substantial revenues and in doing so provided a significant degree of earnings visibility out to 2020 when the group will benefit from a substantial uptick in production as Cosmos is ramped up to full capacity. This represents a significant discount to Macquarie’s 12 month price target of $3.80 which supports its outperform recommendation. While Independence Group (ASX: IGO) is involved in the production of all base metals, as well as having substantial exposure to gold through its joint-venture with AngloGold Ashanti in the 400,000 ounce per year Tropicana project, the company’s roots lie in the nickel industry. On one hand it could be argued that the group’s days of being a substantial nickel play are over with its Long nickel project nearing the end of its mine life, there are three conceptual targets in close proximity to the existing Long mine infrastructure as highlighted below. Given the Long mine in its own right has delivered more than 35 years of production at circa 4% nickel, it isn’t unreasonable to suggest that these areas which lie only a few kilometres to the South of the main orebody could at the very least provide mine life extension or in the medium term prove to be highly profitable long life standalone projects. The following snapshot provides an insight into Long’s prolific production over a 13 year period, but it needs to be borne in mind that this extended well before 2003. While there are plenty of chapters to be written before IGO can paint a clear picture regarding the prospects for the Long region, there is no questioning near-term production upside from the world-class Nova magmatic nickel, copper, cobalt deposit. The project which is located in the Fraser Range, approximately 220 kilometres south-west of Kalgoorlie, was acquired by IGO through the takeover of Sirius Resources in September 2015. By December 2015 the optimisation study was released, resulting in a substantial increase in value, and by mid-2016 IGO announced that it was accelerating development of the Bollinger orebody to unlock significant additional value. IGO’s progress in developing Nova has been outstanding, not surprising given the group’s track record of efficiently operating its other assets over the last decade, usually meeting or beating milestones. The first development ore was mined at Nova in June, and production of nickel and copper concentrates had been flagged for December. As can be seen below, IGO delivered six weeks ahead of schedule and is now positioned to ramp up to full production by mid-2017. The following not only provides near to medium-term production guidance, but the schematic also demonstrates management’s strategy in terms of accessing ore from various parts of the deposit over a period which stretches out to 2030. With regard to the electric vehicle theme, the Nova project should be viewed positively given it will be yielding both nickel and cobalt. Given the substantial earnings upside from Nova will occur in 2018 and 2019 when consensus earnings per share of 33.2 cents and 47.8 cents respectively are forecast, IGO is best measured on those metrics in terms of arriving at a valuation. Based on the company’s current trading range this implies PE multiples of 13.1 in 2018 and 9.1 in 2019. After Western Areas and Independence Group there isn’t a lot to choose from in terms of established producers and there is a sharp drop in market capitalisation when looking at budding producers and/or potential newcomers that have been delivering promising exploration results. However, Panoramic Resources (ASX: PAN) fits the mould. It has a market capitalisation of circa $140 million, but pre-GFC and immediately post GFC the company generated strong earnings and paid healthy dividends from its Savannah and Lanfranchi nickel projects located in Western Australia. 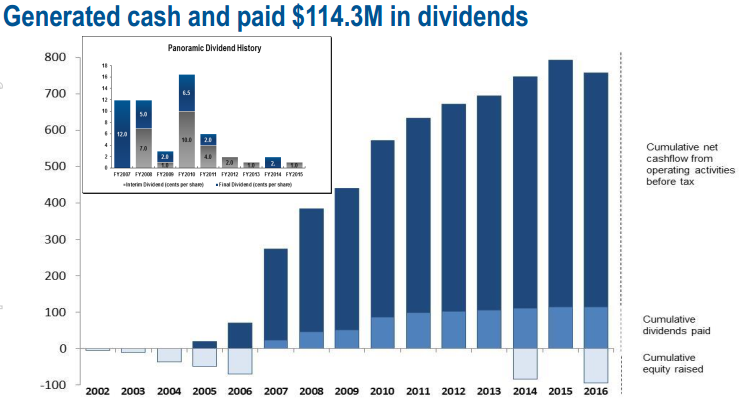 As an indication of the company’s capacity to generate strong shareholder returns when the conditions are right, PAN had a market capitalisation of more than $1 billion in 2007 and generated a net profit of $88 million from revenues of $300 million in fiscal 2007. 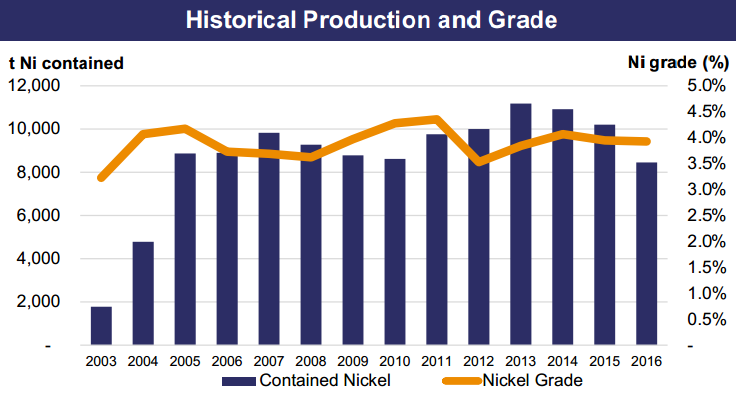 However, due to the lower grade ore produced from most of its assets the nickel price has a make or break effect on the company. Consequently, despite its Savannah and Savannah North projects having a total resource of 226,000 tonnes of nickel, 104,000 tonnes of copper and 15,300 tonnes of cobalt, management had to take the decision to place the projects on care and maintenance in early 2016. PAN’s chairman, Brian Phillips, summed up the situation at the AGM held in late November, saying, “Savannah is among the best endowed sulphide nickel projects in the country, and with the results of the soon-to-be completed feasibility study, an Australian dollar nickel price will be defined that will support restarting the Savannah mine and the development of Savannah North”. Importantly, this isn’t just a case of running new numbers across historical project dynamics. Management is looking at cost reductions across energy, personnel, logistics and consumables in order to bring Savannah back into production. Somers and Partners analyst, Duncan Hughes, likes the stock. He initiated coverage in early October prior to the recent surge in the nickel price, placing a buy recommendation on the stock with a price target of 48 cents. Hughes said, “PAN’s positioned for a rapid restart at US$6.00 per pound and based on relative valuations against peers’ reserves and resources the company looks undervalued. 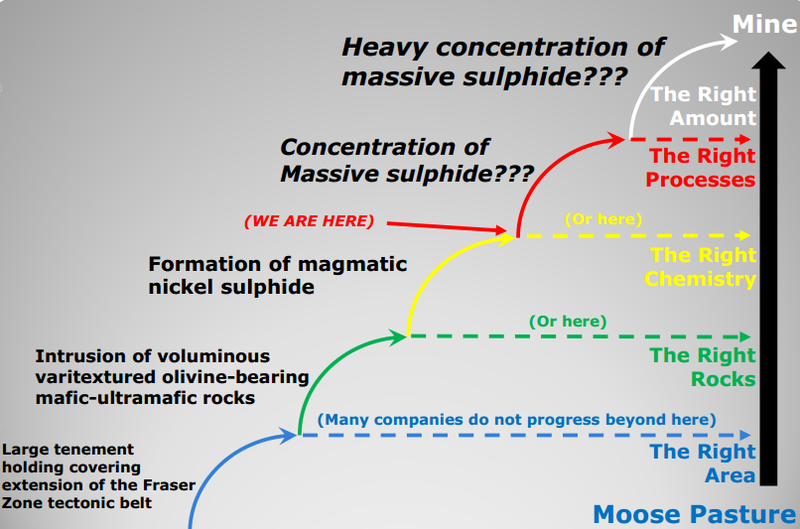 On this note he underlined the fact that the Savannah resources support over 10 years of mine life and the operation has good offtake terms in place for its relatively low grade, but clean nickel concentrate with significant copper and cobalt credits. Consequently, it is important to bear in mind the substantial increase in copper price (circa US$1000 per tonne) since Hughes initiated coverage, as well as factoring in the positive long-term projections for cobalt. Given Mike Millikan from Hartleys has only just initiated coverage on PAN and has factored in more recent numbers regarding commodity prices it is worth noting his projections and price target. However, what needs to be borne in mind is that he is basing his estimates on a US$7.00 per pound nickel price. The rationale behind this is the fact that current ASX listed nickel producers’ share prices reflect a US$7.00 per pound price. Given the sharp uptick in share prices because the sector generally has come back into favour, using a commodity price that reflects market valuations could be questioned and investors should seek professional financial advice if considering a stock in the nickel sector. However, as food for thought Millikan values the company’s assets at 65 cents per share and he has a speculative buy recommendation on the stock with a price target of 56 cents. However at the same time, analyst predictions are no guarantee to eventuate, and should not be used to make an investment decision alone. 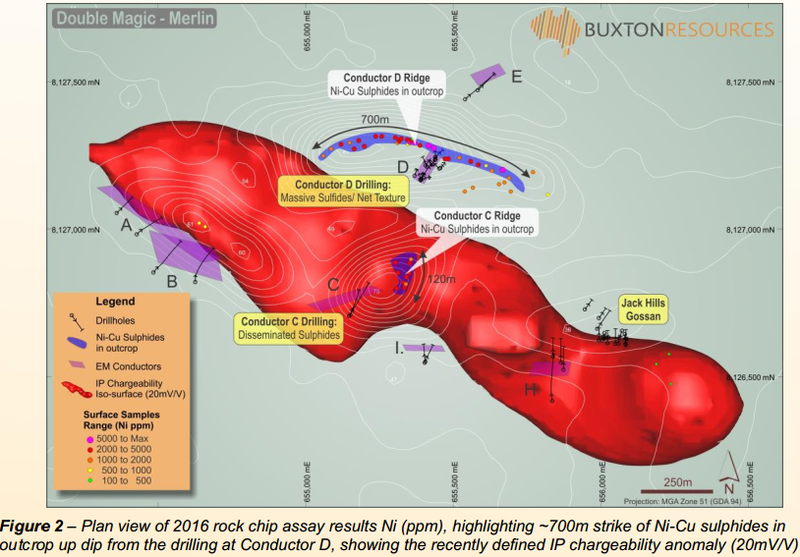 Millikan also covers Buxton Resources (ASX: BUX) which he noted in October had completed a geophysical survey at the Merlin prospect, Double Magic nickel-copper project in the West Kimberley region of Western Australia. He described the anomaly as ‘textbook’ in relation to response, geometry and location, and noted that it appeared well supported by surface geology within a highly favourable tectonic and structural setting. Millikan initiated coverage with a speculative buy recommendation noting that the group offered strong leverage to exploration success. Again, analyst predictions are no guarantee to eventuate, and should not be used to make an investment decision alone. Since then, BUX informed the market that an update on the geological mapping and rock chip sampling carried out during the 2016 field program pointed towards a potentially much larger nickel copper mineralised system than was previously understood at Double Magic. Management explained that the surface mineralisation extended the strike length of the Conductor D mineralisation from circa 65 metres in drilling to more than 700 metres on surface (see schematic below). 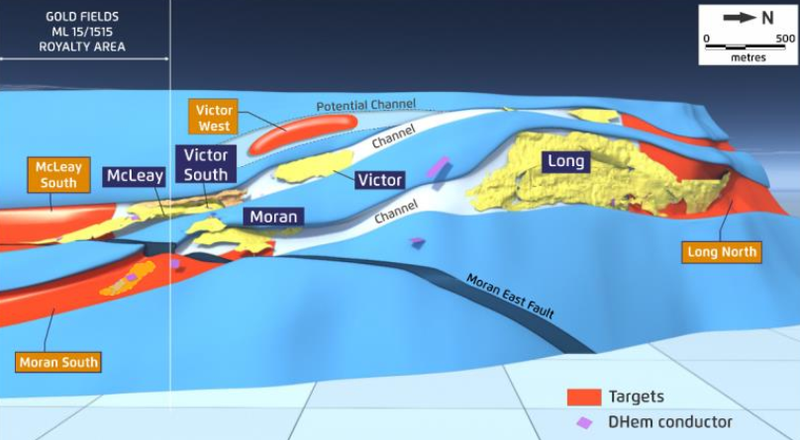 The significance of this development is that it adds confidence to the interpretation that the IP chargeability anomaly represents a large disseminated nickel copper sulphide target with the top of the IP anomaly ranging from 60 metres to 100 metres from surface. This news, combined with the surge in the nickel price has resulted in BUX’s shares increasing from less than 10 cents to an intraday high of 19 cents on December 5. Millikan noted that the new nickel copper discovery at Double Magic lies within a similar tectonic setting as Panoramic Resources’ Savannah project. Similar to BUX, Mount Ridley Mines (ASX: MRD) offers strong leverage to exploration success. Management has been frustrated recently with drilling issues and this appears to have rubbed off on its share price. 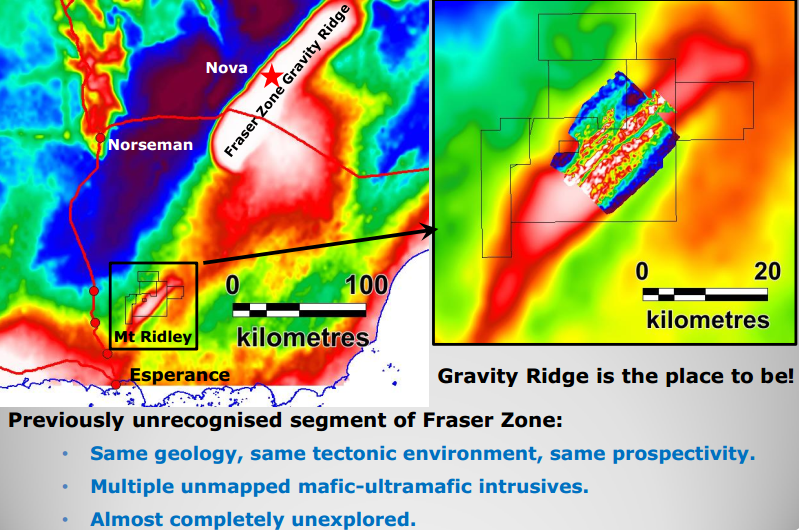 However, the fact remains that the company’s 1000 square kilometres of tenements are in the right address, being situated in the Fraser Range, relatively close to the Nova Bollinger deposit. A more comprehensive take on the particular anomaly being targeted can be found at this link, and the following map demonstrates the proximity to both Nova and Norseman, as well as the similar geological features. While management has struck some hurdles recently, it is worth noting the progress MRD has made and the stage it is at in terms of identifying mineralisation that could provide significant share price momentum (see following milestone chart). It should be noted, however, that this is an early stage play and investors considering this stock for their portfolio should seek professional financial advice. 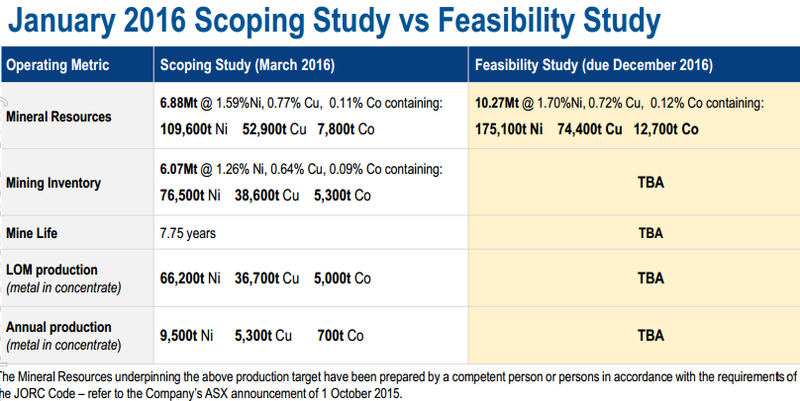 Cassini Resources’ (ASX: CZI) West Musgrave project is the largest undeveloped nickel copper project in Australia. The fact that the company has been able to attract a substantial funding deal with a large player such as Oz Minerals indicates the significant upside on offer as the project undergoes further exploration. Under the terms of the agreement with Oz Minerals, it can earn up to 70% of the project through total expenditure of $36 million which should cover development studies and regional exploration over a staged period of approximately three years. While CZI remains a long-term proposition there are likely to be several share price catalysts along the way including the Nebo Babel scoping study which will build on the optimisation study released in April this year. The optimisation study indicated that the project was positioned on the cusp of the lowest quartile based on C1 global costs with the prospect of an initial mine life of more than 15 years, potentially extending beyond 30 years depending on the progress of the Succoth copper deposit located only 13 kilometres from Nebo Babel. 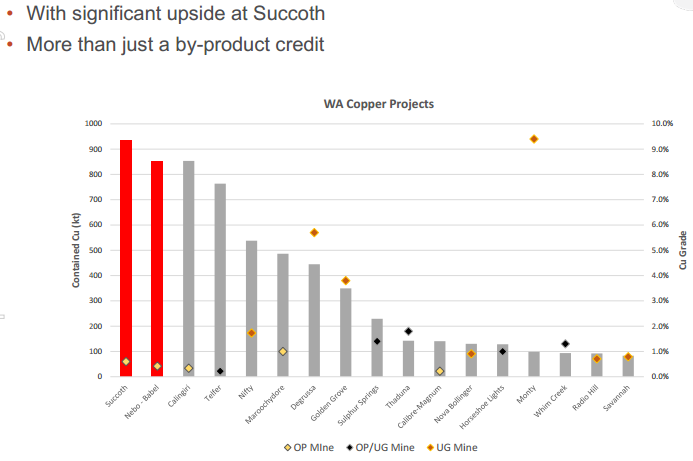 A maiden inferred resource estimate for Succoth was released in December 2015 which stands at 156 million tonnes grading 0.6% copper for 943,000 tonnes of copper metal. 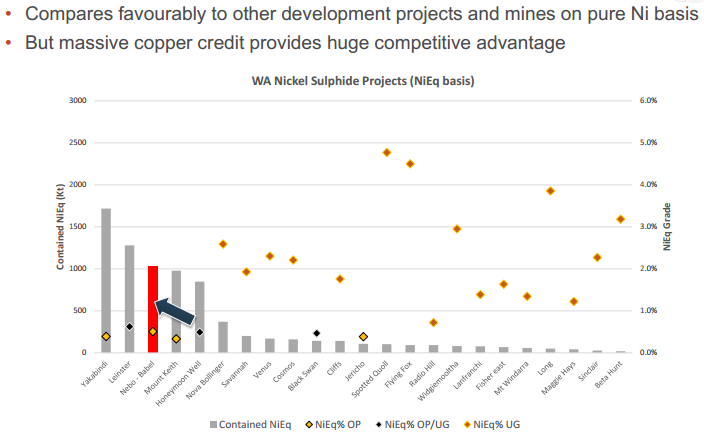 The following graphs demonstrate the scale of both the nickel and copper projects with the data looking impressive in comparison with peers. Millikan also covers CZI and he is impressed with the potential size of the project, noting that the updated scoping study should be completed by September 2017, providing the appropriate operational scale and infrastructure solution to undertake the project. He has a speculative buy recommendation on the stock with a 12 month price target of 15 cents, implying upside of more than 200% relative to the company’s share price prior to entering a trading halt on Wednesday. One final reminder here that analyst predictions are no guarantee to eventuate, and should not be used to make an investment decision alone. It will be interesting to see the news that emerges from the trading halt for CZI. Given management have revealed that it relates to drilling results, one would expect that these are likely to add relevance to the story and perhaps further catalysts.